Fixed-pitch propellers are designed for best efficiency at one speed of rotation and forward speed. This type of propeller provides suitable performance in a narrow range of airspeeds; however, efficiency would suffer considerably outside this range. To provide high-propeller efficiency through a wide range of operation, the propeller blade angle must be controllable. The most effective way of controlling the propeller blade angle is by means of a constant-speed governing system. The constant-speed propeller keeps the blade angle adjusted for maximum efficiency for most conditions of flight. The pilot controls the engine revolutions per minute (rpm) indirectly by means of a propeller control in the flightdeck, which is connected to a propeller governor. For maximum takeoff power, the propeller control is moved all the way forward to the low pitch/high rpm position, and the throttle is moved forward to the maximum allowable manifold pressure position. [Figure 11- 6] To reduce power for climb or cruise, manifold pressure is reduced to the desired value with the throttle, and the engine rpm is reduced by moving the propeller control back toward the high pitch/low rpm position until the desired rpm is observed on the tachometer. Pulling back on the propeller control causes the propeller blades to move to a higher angle. Increasing the propeller blade angle (of attack) results in an increase in the resistance of the air. This puts a load on the engine so it slows down. In other words, the resistance of the air at the higher blade angle is greater than the torque, or power, delivered to the propeller by the engine, so it slows down to a point where forces are in balance. When an aircraft engine is running at constant speed, the torque (power) exerted by the engine at the propeller shaft must equal the opposing load provided by the resistance of the air. The rpm is controlled by regulating the torque absorbed by the propeller—in other words by increasing or decreasing the resistance offered by the air to the propeller. This is accomplished with a constant-speed propeller by means of a governor. The governor, in most cases, is geared to the engine crankshaft and thus is sensitive to changes in engine rpm. When an airplane is nosed up into a climb from level flight, the engine tends to slow down. Since the governor is sensitive to small changes in engine rpm, it decreases the blade angle just enough to keep the engine speed from falling off. If the airplane is nosed down into a dive, the governor increases the blade angle enough to prevent the engine from overspeeding. This allows the engine to maintain a constant rpm thereby maintaining the power output. Changes in airspeed and power can be obtained by changing rpm at a constant manifold pressure; by changing the manifold pressure at a constant rpm; or by changing both rpm and manifold pressure. The constant-speed propeller makes it possible to obtain an infinite number of power settings. At the same time, it allows the propeller to handle a smaller mass of air per revolution. This light load allows the engine to turn at maximum rpm and develop maximum power. Although the mass of air per revolution is small, the number of rpm is high. Thrust is maximum at the beginning of the takeoff and then decreases as the airplane gains speed and the airplane drag increases. Due to the high slipstream velocity during takeoff, the effective lift of the wing behind the propeller(s) is increased. As the airspeed increases after lift-off, the load on the engine is lightened because of the small blade angle. The governor senses this and increases the blade angle slightly. Again, the higher blade angle, with the higher speeds, keeps the AOA with respect to the relative wind small and efficient. For climb after takeoff, the power output of the engine is reduced to climb power by decreasing the manifold pressure and lowering rpm by increasing the blade angle. At the higher (climb) airspeed and the higher blade angle, the propeller is handling a greater mass of air per second at a lower slipstream velocity. This reduction in power is offset by the increase in propeller efficiency. The AOA is again kept small by the increase in the blade angle with an increase in airspeed. At cruising altitude, when the airplane is in level flight, less power is required to produce a higher airspeed than is used in climb. Consequently, engine power is again reduced by lowering the manifold pressure and increasing the blade angle (to decrease rpm). The higher airspeed and higher blade angle enable the propeller to handle a still greater mass of air per second at still smaller slipstream velocity. At normal cruising speeds, propeller efficiency is at or near maximum efficiency. 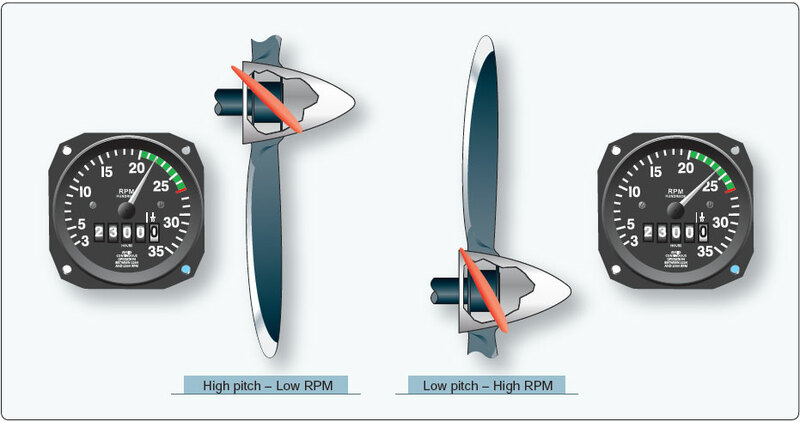 Once the rpm settings for the propeller are selected, the propeller governor automatically adjusts the blade angle to maintain the selected rpm. It does this by using oil pressure. Generally, the oil pressure used for pitch change comes directly from the engine lubricating system. When a governor is employed, engine oil is used and the oil pressure is usually boosted by a pump that is integrated with the governor. The higher pressure provides a quicker blade angle change. The rpm at which the propeller is to operate is adjusted in the governor head. The pilot changes this setting by changing the position of the governor rack through the flightdeck propeller control. 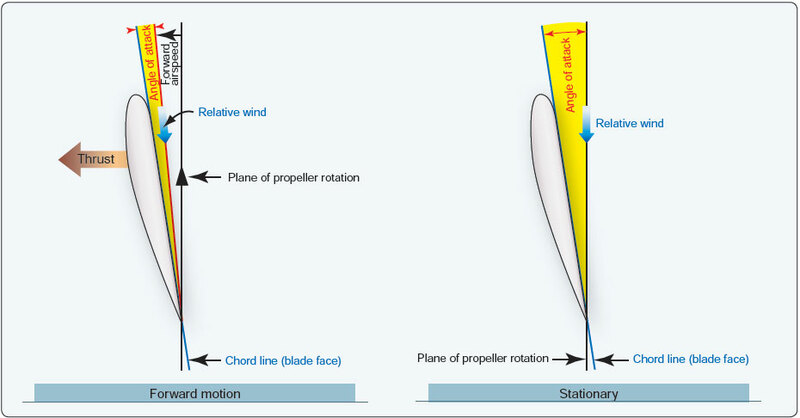 On some constant-speed propellers, changes in pitch are obtained by the use of an inherent centrifugal twisting moment of the blades that tends to flatten the blades toward low pitch and oil pressure applied to a hydraulic piston connected to the propeller blades which moves them toward high pitch. Another type of constant-speed propeller uses counterweights attached to the blade shanks in the hub. Governor oil pressure and the blade twisting moment move the blades toward the low pitch position, and centrifugal force acting on the counterweights moves them (and the blades) toward the high pitch position. In the first case above, governor oil pressure moves the blades towards high pitch and in the second case, governor oil pressure and the blade twisting moment move the blades toward low pitch. A loss of governor oil pressure, therefore, affects each differently.